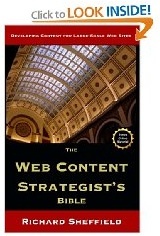 You guys asked me to help make creating your Web content strategy deliverables a bit easier, so here you go. I just added a pretty cool content matrix template .xls file to the download area for book purchasers. If you are already a customer, you should have received and email from me by now with a note about the content matrix template and the link to the download page. This content matrix template has 44 columns and captures everything that I could think of regarding the content development and editorial process. I tweaked it with a bit of color coding, column filters, frozen frames, and development phase identifiers. This is pretty much exactly how I use a content matrix in my big projects.To try and make things are clear as possible I also added twenty, or so, rows of sample project data so you can see examples of what the data looks like that goes in each column. Even having done this dozens of times before, it still took me about four hours to type everything in and get things exactly like I want them. It should save you at least that much time, so grab a copy of the content matrix template, add your own name and company logo, hide the columns that are not needed for your project, then take a long lunch on me! The link does not seem to work. Where can the file be accessed?